Four (4) years-old on or before Sept. 1, 2019. Come from a family whose income (according to standards set by the State Board for Educator Certification) is at or below subsistence level. Unable to speak or comprehend the English language. 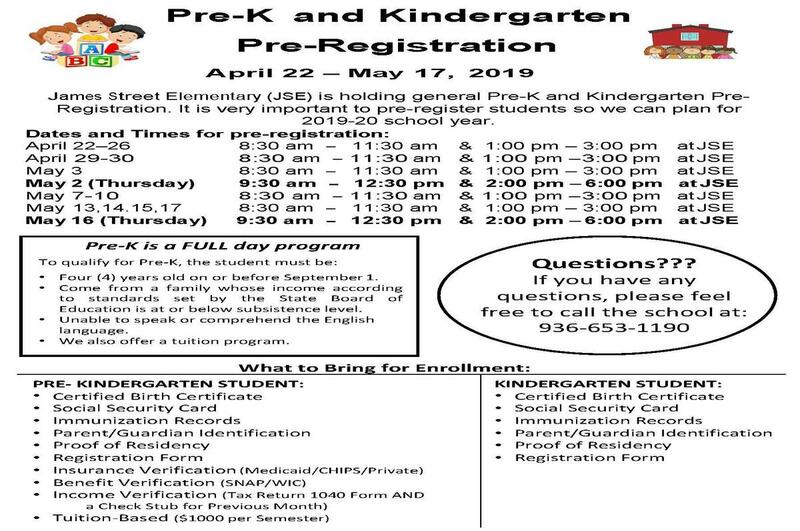 Kindergarten students must by five (5) years or older by Sept. 1, 2019 to enroll. 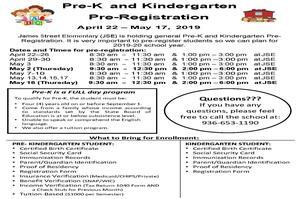 April 22-30 on regular school days - 8:30 to 11:30 a.m. and 1 to 3 p.m.
May 2 (Thursday) - 9:30 a.m. to 12:30 p.m. and 2 to 6 p.m.
May 3 and May 7-10 - 8:30 to 11:30 a.m. and 1 to 3 p.m.
May 13-15 and May 17 - 8:30 to 11:30 a.m. and 1 to 3 p.m.
May 16 (Thursday) - 9:30 a.m. to 12:30 p.m. and 2 to 6 p.m. If you have any questions, please contact the James Street Elementary Attendance Office at 936-653-1190.